Kayak fishing is booming, and a lot of people have learned just how easy it is to get into. Here are a few tips at how you can up your game as a kayak fisherman. One thing that can help on your journey from novice kayak angler to seasoned pro is acquiring the right gear. While it may be fun to experiment with a new hobby on a shoestring budget, once you’re hooked on kayak fishing, it makes sense to purchase some of the specialized equipment that makes the sport easier. While you can get by without most of these items, each one can play an important role in improving your on-the-water performance. We kept this list short because it’s easy to go too far with your kayak fishing gear. Countless accessories are available, but you only have so much room on your ‘yak. Keep it simple, decide exactly what you need, and leave it at that. Figure out where you want to fish. You may wish to avoid open water, selecting a large but protected cove instead. Select a launch site near that cove. Estimate how long you’ll fish and schedule accordingly. Bring food and something to help you stay hydrated. If you can predict a few aspects of your trip, you may end up modifying your gear list or deciding to leave the house an hour earlier than you would have. One of the major benefits of kayak fishing is how quiet the boats are. You can ease into a cove, silently glide within range of a good-looking spot, and make your first cast without any fish even knowing you’re there. Make the most of that feature of kayaks. Don’t slam your boat into cover or plop your gear down too hard. Avoid aggressive paddling techniques, opting for smooth, quiet strokes instead. If you’re in an especially shallow area and you feel like you’ve made too much racket, back off to another section and let everything settle down, then return. 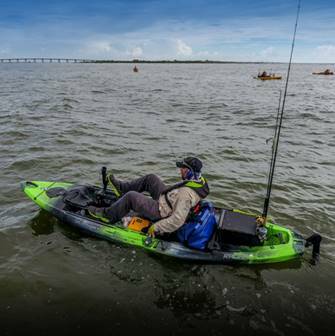 Some models are more stable than others, and huge advancements in hull design have been made to help solve the problem, but it’s an aspect of kayak fishing that we need to get used to. That’s actually the key to feeling comfortable on a kayak—getting used to it. What seems unstable in the beginning will quickly become a very natural feeling after just a few trips. If you’re new to the sport and always think you’re about 10 seconds away from ending up in the water, just keep at it. Log some quality time in your ‘yak and soon it will become like a second home. When you’re kayaking fishing, there are a few things that can go wrong—things that are less of a concern when fishing out of a normal boat. To avoid getting swamped, tangled in brush, or coming face-to-face with wildlife, you have to stay alert. Be aware of your surroundings, have some idea about the expected weather, and pack a first aid kit. Also, always wear your PFD! If you have one, wear it. If you don’t have one, buy one, then wear it! The self-inflating kind might spend more time on your body (where it belongs) than regular PFDs. Kayak fishing can be a blast, but in the very beginning, there are usually a few challenges. We hope these tips will help you become a better kayak fisherman, so you can safely enjoy the hobby for years to come. For more info, check out Fishing Refined. 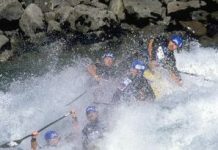 Previous articleWorld Rafting Returns to Futaleufu After 20 Years!